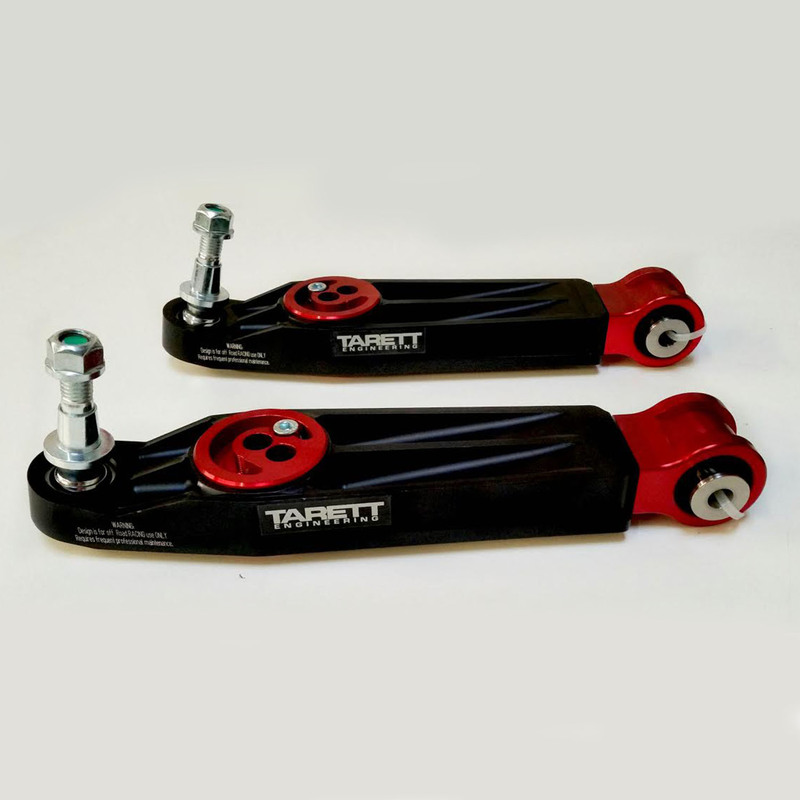 Introducing the Cup-Series lower control arms for your Porsche 996/997/986/987/981 & 991. Much more than just another billet replica of the GT3 arm; this design is superior to any other aluminum arm on the market. For safety, the problematic 12mm ball joint design, used on both OEM and other aftermarket arms, has been completely redesigned for a full proof, larger, significantly stronger and more reliable design that you can count on. The ball joint consists of a replaceable oversized precision grade Teflon lined monoball bushing. High misalignment bushings provide safe and bind free operation at any ride height. Solid thrust arm bushings and sealed monoball inner ends are used to eliminate the spongy rubber OEM bushings and provide a precision ride for improved feedback, steering response, and overall handling. Both are CNC machined from 6061-T6 aluminum alloy and are anodized red for a corrosion resistant and attractive finish. The solid thrust arm bushing is adjustable for increasing or decreasing wheelbase and adjustable caster. Camber and track width can be accurately and repeatedly adjusted with precision GT3 style shims. A competition proven design that allows for up to 20mm of adjustment per side and up to an additional 2 degrees of negative camber. The main housing is CAD designed and also machined from 6061-T6 aluminum for optimized strength and weight. It’s hard anodized for a highly durable corrosion resistant finish. The unique rib design allows for easy access to the inner arm hardware, which is another problem with the OEM and other available arms. Please do not hesitate to call us for any advice on setup, 336-793-2134.